It’s cliche to say that most movies turned into games are mediocre, or worse. After all, they’re based upon branding and focus groups and generally are marketing tools more than inventive games that move games forward. But just imagine what a terrific platformer director Hayao Miyazaki’s Spirited Away would have made. What a great loss it is — not having a game based on this touching, imaginative, generally haunting film about Sen, a plucky (even loud) girl who loses her parents in a strange spirit world. Sen is boisterous, independent, heroic, as a adventurous as Link from The Legend of Zelda. The pampered, giant baby as a frightening boss. The mysterious train treading through water and perhaps halting at some new stops along the way for missions. The mysterious, black-goggled janitor hovering over his furnace with his spider-like minions deep below the town could have a Pikmin feel. The parents turned into pigs and lost in a pig sty add anything from fighting pigs to puzzle solving. Riding Haku in his dragon form adds thrills as well. It’s a movie just begging to be a game. 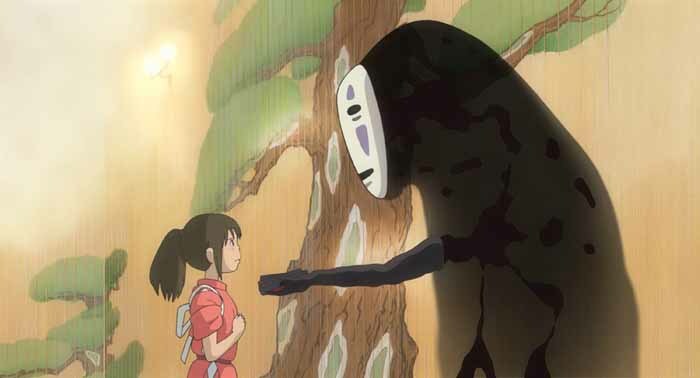 How did game developers, corporate or indie, miss Spirited Away? It won an Oscar for Best Animated Feature, for God’s sake. It’s a total failure on the part of the industry for critics and game fans a like. I counted at least 20 scenes that could have been riffed upon for an adventure-based platformer. Here’s the complete 2001 movie via Google Video. Watch it and judge for yourself even as you’re moved.